Madge S. submitted this photo and caption. 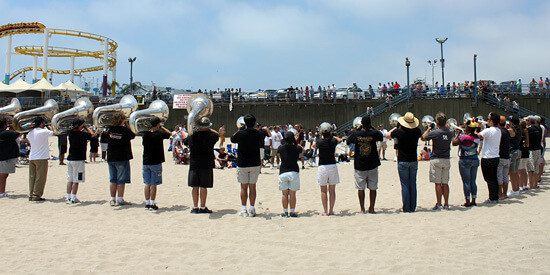 On Sunday, July 18, 2010, the San Francisco Renegades and SoCal Dream joined together to perform at the inaugural Sin City Regiment Beach Blast at the Santa Monica Pier in California. The drum lines and horn lines from Renegades and Dream combined for warm-ups to give the crowd an extra dose of LOUD! Then, each corps performed a standstill of their show to the delight of the large crowd gathered on the pier and on the beach. It was a fantastic end to a great weekend of drum corps in SoCal!